I received the following items for the purpose of this review. All opinions are my own. If you've been following Eight in the Nest, you know that we really like Peppa Pig here. This cute little pig takes you through her adventures in her short animated episodes. 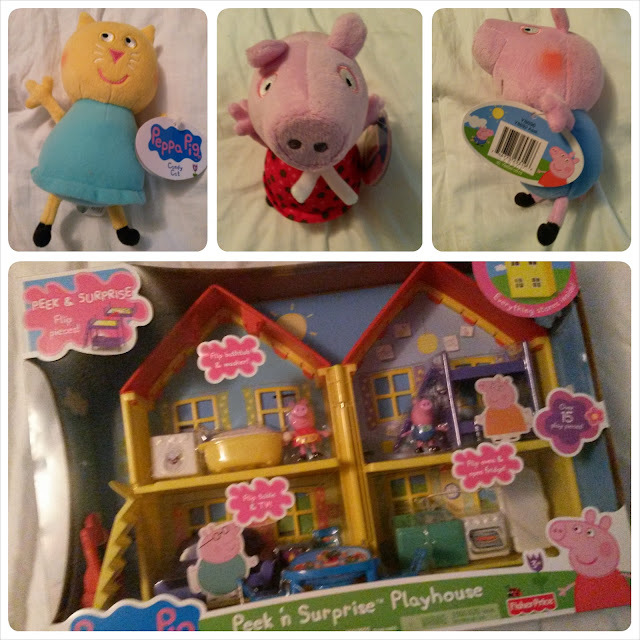 If your little one is a fan of Peppa, too, be sure to check out the adorable items available this holiday season! On the top row we have Candy Cat, Peppa, and her little brother, George. These cute 9" plushes will be great friends. They would make a great stocking stuffer! The Peek 'n Surprise Playhouse is a great take-along toy. The house folds into a carrying case so it keeps the smaller pieces together and can go wherever your little one needs to! The furniture inside has two fun sides so that kids can play out different scenarios (like making beds, cleaning dishes and filling bubble bathes)! Annabelle (and her brothers) love this toy. My only wish is that the flip over pieces stayed in a bit better because the kids really like to take them out- but then need my help to get them back in. The Peek 'n Surprise playhouse is recommended for ages 3+.